For the second year in a row, one of our flagship websites has been included in BtoB Magazine's annual list of "10 Great Media Sites". This year, www.FireRescue1.com was recognized as the top site in the business-to-business Trade media category, alongside leading media companies in other categories, such as the Financial Times, ITWorld and Focus.com. In determining the list, sites were evaluated in a number of areas, including appearance; organization and navigation; search functionality; video and other multimedia content; and community/social media (Web 2.0) features. BtoB received a record number of nominations this year, with more than 60 sites submitting applications. The award is a testament to our Fire team's hard work developing the site over the past 5 years. 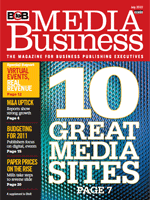 I'm reading: FireRescue1.com named to 2010 list of “10 Great Media Sites” by BtoB MagazineTweet this!